Gaming Mouse Pad System featuring the Killenflor Gaming Mouse Pad. The Killenflor™ is a semi-rigid mouse pad specifically designed to provide an ideal tough, low-friction glide surface for steel glide bearings as well as conventional teflon mouse glides. Its optically bright surface ensures maximum dpi for optimal sensor reads for perfection in fast optical tracking for the RTR- 720 and all other optical mice. The LaunchPad is an integrated system of mouse pad, frame/mounting system and cord handling device. Satin-finished .015” poly vinyl acetate (PVA) film provides a superbly smooth but tough glide surface that can be “tuned” with GWS Killenflor™ Wax Mouse Pad Treatment for the ultimate in smoothness and glide. This special unwoven rayon and polyester mat is the “floor” that gives the pad its amazing optical responsiveness. Surface texture is ideal for optical sensor feature detection, and the reflective properties of the fiber mat keeps the sensor working with maximum light and dpi, even with fast moves! Closed cell polyurethane foam provides lightweight, tough backing with sure grip to desktop surface. Weight on the mousepad transfers to “grip” on the desktop by the cellular tension of the base laminate, and in combination with the CornerMount™ system provides unbeatable freedom from slippage. Gamers need a mouse pad system that stays precisely in place even during the most active sessions. The CornerMount™ system is an industrial grade solution to mouse pad slippage: Recessed holes in the base laminate at each corner are filled with re-positional adhesive putty which “stick” the corners of the mouse pad directly to the desktop. The putty used is a commercially available product used to supply secure re-positional mounting adhesion between objects. Just remove the protective film from the corners, position the pad on the desktop, and press lightly on the 4 corners to set the pad. To remove or reposition, grasp the pad at one end, and wiggle slightly to free the corners as you raise it from the surface. The CornerMount™ system allows the pad to be securely positioned and repositioned virtually indefinitely. The RTR-720 utilizes the combined movement of the fingers and thumb to move and control the mouse precisely, without requiring movement of the hand itself. Keeping the hand centered on the mouse pad improves the comfort and precision of mouse handling. 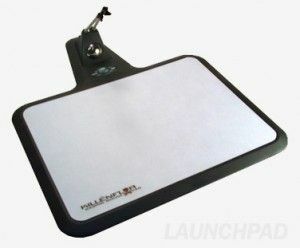 By placing the little finger directly on the mouse pad to steady mouse movement (similar to the way a pool player steadies the pool cue,) the stability provided can improve mouse movement control. The Swivel, (a hole at the right edge of the board) can be used by the little finger to apply positive or negative force in any direction as an added means of control that can “guide and correct” mouse movement. It expands the “sweet spot” zone of high accuracy and control; while the thumb and fingers are moving the mouse normally, the little finger can pull or push the entire hand. This compound motion can be used to increase both speed and precision of mouse movement, and provides a truly competitive gaming fundamental for the rotary grip form function (RGFF™) mouse user.